I'm starting on the engine rebuild, again. It's been so dark and wet the last few weeks that I've been forced to add new lighting to my garage just so I can work in the gloom. New rod bearings have been sourced from Tasmania. Weird, I know. The bearings are from a Holden- some odd Aussie sedan that never went to the UK or the US (also works in a Bedford and a Vauxhall from the UK). Who knows why they fit (knowing Lotus they were probably trying to save development costs way back when), but they do. The quality is slightly better than the old Vandervells. ACI bearing shells from Tasmania has resulted in a 50% savings in cost for me (which, today, is pretty much no longer availabe), but involves a bit more labor to allow the new bearings to fit (as the nib is on the other side), details in the rebuild section this month. It takes about 10 - 15 minutes per rod to do the necessary filing, so nothing too terrible. I've also been working on the brake system. All the brake lines under the bonnet looked rather grubby, so I've removed them all and sanded them down with 500 grit emery paper. Once shinny and looking nice I've coated them with a clear, durable, UV resistant enamel. It looks much better now. You can't have everything looking all nice with ugly brake lines, right? 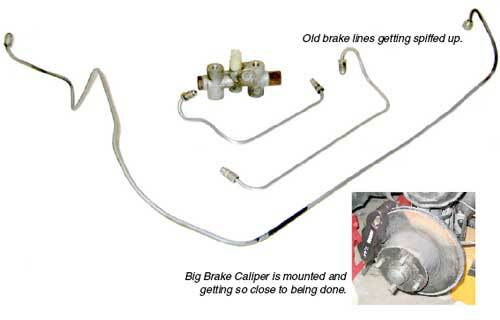 The JHPS Jensport Big Brake Caliper is on the car, but I'm still waiting for the right size rigid tubes to come back. I flubbed up and had some prototype tubes made that didn't fit- it seems once the car was lowered and the spring compressed there was some interference- can't have that. That's all been sorted out now and I'm getting close to getting fluid into the complete system in the next few weeks. I've also made a trip to LA to get some custom wheel adaptors made. The stock wheels need to push out a bit to clear the calipers. Another project taking too much time. It seems the wheel studs on the JH are hopelessly antiquated and additional studs (to fit these adaptors) to make the whole thing work must be manufactured.